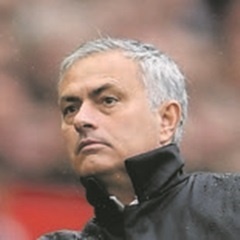 London - Manchester United manager Jose Mourinho insisted his side's Premier League title ambitions were still intact despite a 1-0 loss away to former club Chelsea on Sunday. "We are second - not fifth, sixth or seventh or eighth," Mourinho told Sky Sports after his third straight loss at Stamford Bridge since he became United manager. "We had chances. If I remember (Romelu) Lukaku shot in the first half and in the last part of the game with the (Marcus) Rashford shot... We had lots of chances to score goals," Mourinho said. "It’s an important victory," said Conte. "When you play against Manchester United it’s always a massive game. This type of win is important for our confidence. We showed great desire and passion to win this kind of game. “We can win or lose but our spirit must be this. Last season our spirit was in every game - we started this season with a lot of problems. We were up and down. This game showed if we want we can." Chelsea defender David Luiz was not even on the bench for this match and Conte was coy when asked if the Brazilian, in his second stint with the Blues, still had future with the west London club. Meanwhile Chelsea midfielder Cesc Fabregas, who said the Blues might have won by an even bigger margin, was proud of the team's resilience.